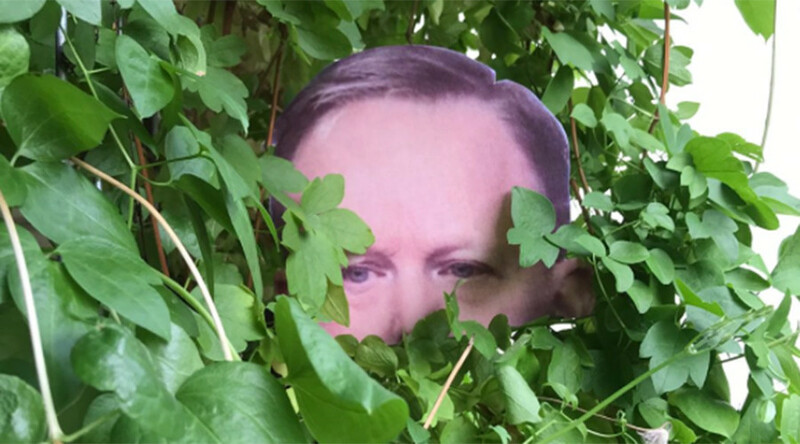 Sean Spicer may never live down his 'hiding-in-the-bushes' moment – especially now cardboard cutouts of the White House press secretary’s head are popping up in bushes around the world. The two dimensional Spicers are the work of a university lecturer from British Columbia. Lisa Kadonaga was inspired to create the Spicer hedge topper when she noticed her neighbors’ bush had a likeness to the bushes in which Spicer was said to be nestled. She realized her town had plenty of similar bushes in which to hide Spicer. The questionable bush decor grew from Spicer’s infamous encounter with journalists after President Donald Trump's decision to fire FBI Director James Comey. The Washington Post reported the press secretary “spent several minutes hidden in the bushes,” after giving a TV interview. Spicer then answered some questions off-camera surrounded by the foliage. The newspaper later clarified that Spicer was “hidden in the darkness and among bushes” after the White House complained, but the more amusing scenario was already out there for all to enjoy. After printing off a headshot of the White House spokesman, Kadonaga planted him in a suitable bush and posted the result to Facebook, “as a chuckle for a few people,” she told CBC News. “I was really stunned as the picture of the preparation and the installation in the bushes kinda took off,” she said. Spicer’s head has sprouted like a weed in bushes as far afield as Germany and New Zealand, the Washington Post reports. Kadonaga responded to the reception by helpfully uploading a template online, which received so much traffic, Dropbox temporarily closed her account.